Look Of The Day: Over 40 Style. Happy Tuesday. Hope you have had a lovely start to the week? Yesterday I did a spinning class in the morning and some running with my Daughter after school so was feeling very happy and motivated!! Wow, it has turned cold outside this week though, hasn’t it? 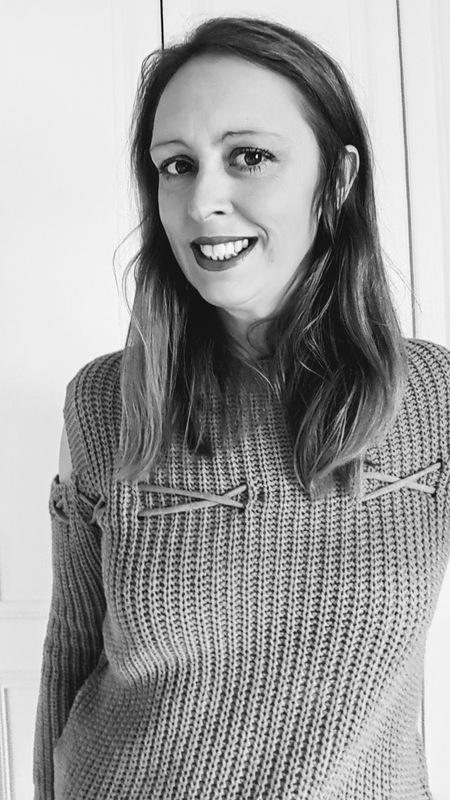 Being a work from home Mum can sometimes have me to wearing lots of sweatshirts and joggers throughout the day. I try to dress stylish but I always feel the cold quickly in Autumn and Winter. Joggers and sweatshirts are my got to items to keep me warm and are OK but then when I rush out to the shops or into town for something quick, I always see someone I know and then I think, I wish I had made more of an effort. 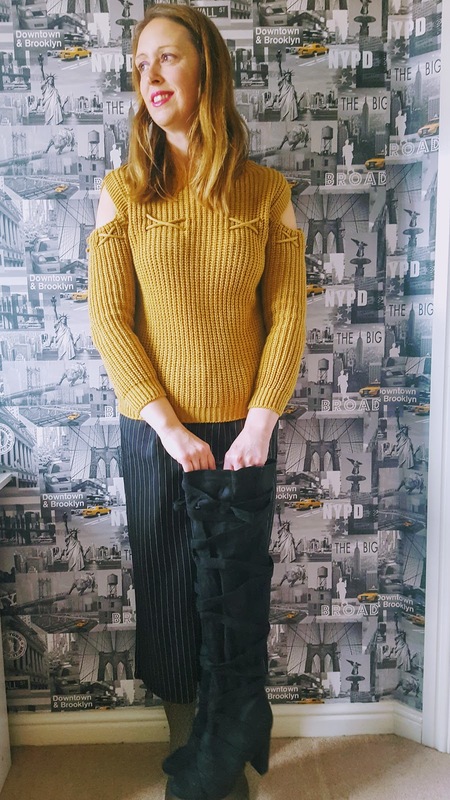 Last week L |O | T| D came to the rescue and asked me if I would like to pick a favourite outfit from their website to create a nice and warm stylish Look Of The Day. One of my favourite colours for Winter is mustard. I adore mustard and I often will be seen wearing my mustard tights. My Daughter loves the colour too but she says I should tone it down a little as I do get a lot of stares when I wear the brighter colours. This why I went for this darker colour mustard jumper as well as loving the style too. It is beautiful, isn’t it? Stylish cold shoulder jumper featuring a cross lace detail, long sleeves, a crew neckline and a knitted finish. 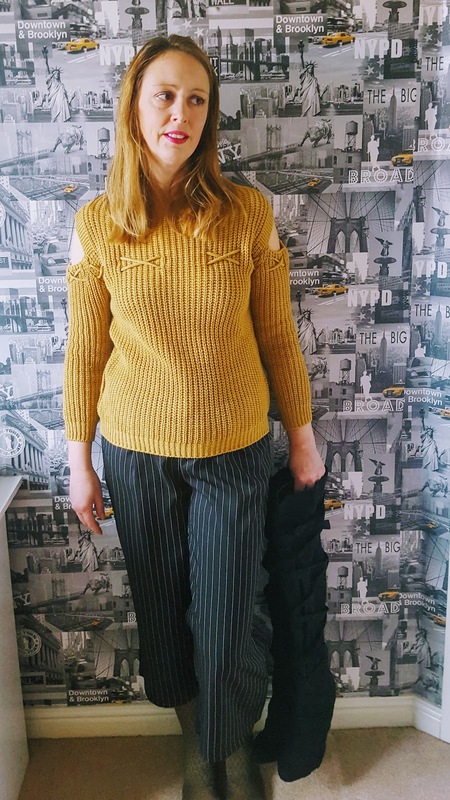 If you love the jumper too but not a fan of mustard, no worries as they do this jumper in two more lovely colours; black and fango. Next up I wanted a change from Jogging pants or jeans, my usual go-to daywear. 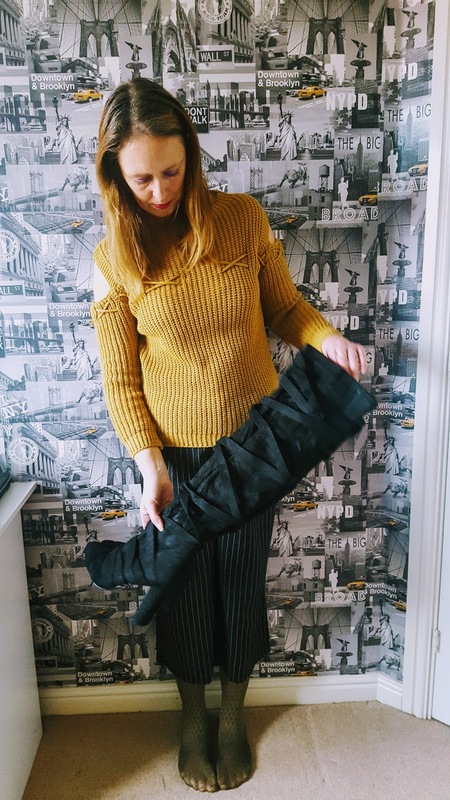 I loved these 3 quarter legged cropped pinstriped trousers in navy straight away, they look amazing but as they only have a small or large in stock at the minute I went for them in black. I love the style of these and the cropped legs. So different and they will look amazing with any style boots over Autumn/Winter. £30.00 Each. Colours Black or navy. These thigh boots are great. They look amazing and I am really pleased with these. I think they are a real bargain at £25.00 a pair. They look beautiful on. I really love the style, colour feel and quality of these boots. This whole outfit cost £75.00 and I think it is a real bargain!! L | O | T |D are kindly offering my lovely readers 30% off their order!! 30%!! What a great deal. So if you were to buy a £75.00 outfit like this it would only cost you £52.50 how amazing is that!! Knocking £22.50 off your bill at the checkout. All you need to do to get 30% off is add this promo code at the checkout. Before you pay there is a box to add a code in and it will knock you 30% off. The 30% off code is – BLOGLOVE30. What do you think of the outfit I picked out for day wear? Let me know if you get to use the 30% discount code. I would love to hear what you picked. I was kindly offered an outfit of my choice and a discount code to offer my readers. All thoughts are my own and I was not paid to write this post. Please check out L | O| T| D| website for terms and conditions of this discount code. The 30% off code doesn’t have an expiration, at the moment. They have the rights to stop this offer if needed. South African Plum Sauce With Duck Stir Fry. World Kindness Day: Creative Mondays Blog Hop. Review: True To Its Name Rich And Irresistible Co-op Mashing Potatoes. "South African Plum Sauce With Duck Stir Fry"
"How To Make Meat Free Quorn Mini Quiche Lorraine"
I love mustard. Such a great colour for the season. And you look amazing. I love that jumper, very autumnal. I love being able to layer clothes in the autumn, it leaves a lot of room to be creative. I love the colour of the jumper, and those boots…..wow! 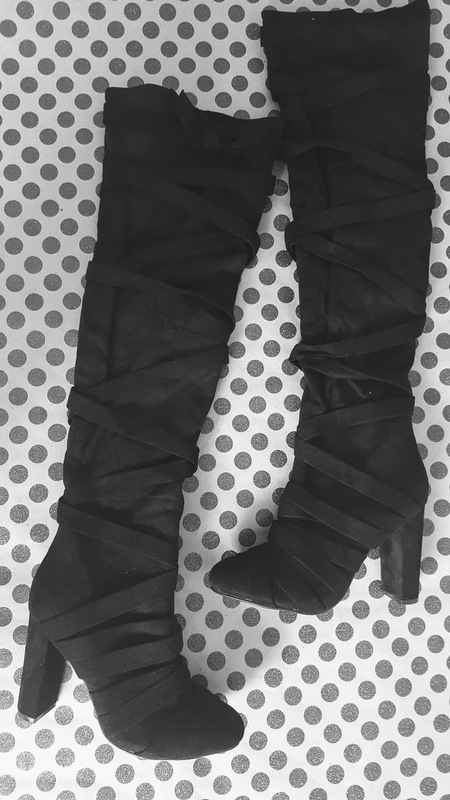 I would love to be brave enough to wear thigh high boots. I think it's a great outfit and the boots are perfect! Thanks lovely 🙂 I remember these days well. Mine are all grown up now so I can wear heels again. What a gorgeous outfit, the weather has definitely turned colder the last couple of days. Oh gorgeous! I love that mustard jumper! Oh wow those boots are gorgeous and a bargain at only £25. I need some jumpers as mine look knackered. Better hurry it's getting colder. Thanks Melanie 🙂 plus a discount at the minute. I love the jumper. Such a beautiful colour! You look great as always. I LOVE your outfit you chose! Mustard looks good on you! I love how the sweater looks stylish and comfortable!- Natalie A.